RAM Commander Spare Parts Analysis and Optimization is based on two cost optimization criteria: Total No Shortage Probability (NSP) & Availability. The module performs Cost-Availability optimization of repairable and discardable parts for all levels of repair. 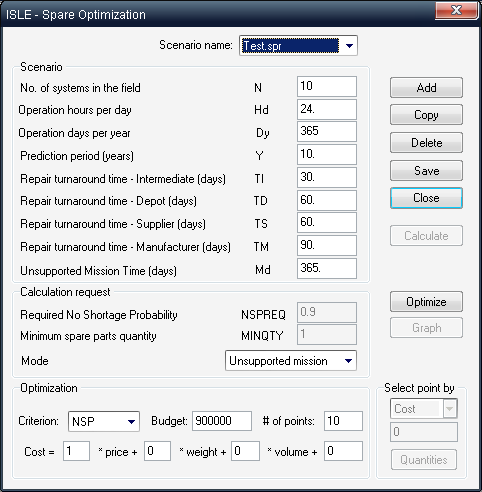 Spare Parts Analysis and Optimization module takes into account the variety of mission applications, e.g., when the primary restriction is weight or volume, such as for fly-away kits or when no repair or supply of spare parts is permitted (unsupported mission). Data entry for the module is minimized since the module uses data and calculations already stored in RAM Commander project. The optimization algorithm is based on convex programming as outlined in the flow chart below.